The first documented instance of Dollissa Day was held in Sunrise, Florida, in 1986. Two cultures came together to celebrate this birth event of a teeny tiny Jewish-Puerto Rican baby who was no larger than a thimble. Her small size was a surprise to one and all because a C-section had been ordered. A humble granite marker will soon mark the operating room in which this miracle was performed, courtesy of the enthusiastic support of the entire population of the town. Being an accomplished world traveler, several locations around the world have shrines dedicated to places where she has sat and complained, and to other places where she has fallen over and injured herself in seemingly impossible ways. From Natal to Las Vegas, including Turks and Caicos, Machu Picchu, Italy, and Israel, good people gather ’round to tell stories of her achievements, and boast of personal contact and interactions that they may have experienced. Dollissa Day is now observed in every State in our Union and in most corners of the globe. At various times from January to December but chiefly in this month of June, you shall give a day or part of a day to special exercises and perhaps to actual chanting in recognition of the importance of Dollissa to us as a nation and of what she yields in generosity, sneers, and entertainment to the communities in which we live. That’s all I’ve got for now. But at least I have set myself up for next year’s Dollissa Day Post! 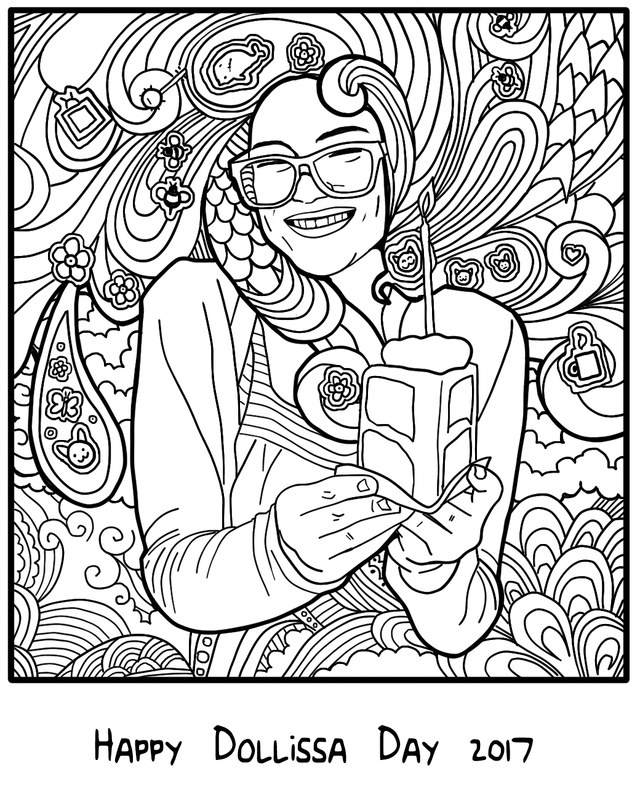 Meanwhile, this year, YOU lucky readers can print out and color this page I have made to honor her. She is surrounded by like five of her interests, including a banjo — that’s not a lollipop. Use the wackiest colors, listen to the bee playlist, and write some poems about this Sneero.